We have written a few posts on natural flea remedies and how to deal with fleas without harsh chemical insecticides. Up until now, these posts have focused on eradicating fleas on the pets themselves, and within the home (such as this simple flea trap). 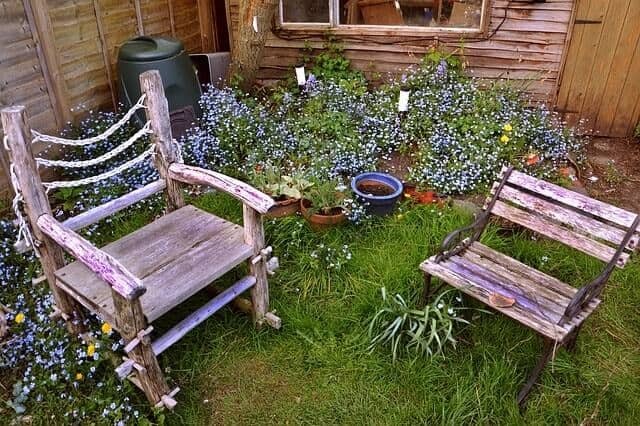 The thing is – your garden/yard is an extension of your home. If your pets have had fleas and have brought them into your home, they have also brought them into your garden/yard. If you treat your pets for fleas directly, but don’t treat your home, fleas in your home will continue to breed, hatch from eggs and re-infest your pet. This is the same with your outdoor spaces. Therefore, it is important to work to eradicate the fleas there too. You can obviously purchase chemical insecticide sprays that will kill fleas in your yard but I have done some research online, and it appears you can make a very effective natural flea yard spray with garlic. This homemade garlic spray is not recommended for use indoors. Firstly, your home would stink! Secondly, garlic can be harmful to dogs. That said, it takes a lot of garlic in high concentration to present health problems for dogs, so using this garlic flea spray outdoors in wide-open spaces isn’t likely to cause any issues for your dog. Garlic not only repels fleas – it kills them. It is not really clear how or why garlic is effective against fleas, but it seems to be most effective and works on the eggs and larvae of the fleas to kill them before they reach adulthood; this stops the fleas from being able to breed. Regularly spraying the garlic solution enables you to maintain a barrier around the yard to prevent the fleas from returning to the breeding ground. The recipe couldn’t be simpler! The basic solution calls for just two whole bulbs of garlic peeled, chopped into small pieces, and placed in a jar, covered with boiling water, and left overnight. Additional ingredients such hot peppers and castile soaps can be added in increments of 1 tablespoon for every quart of solution. These ingredients are not necessary, but some add them for additional protection or to make the solution smell better. Vegetable oil is another ingredient that can be added to the garlic solution with the same ratio. Although vegetable oil is not essential, it can help the solution adhere to surfaces and plants outside. Note: Depending on the size of the area you are treating, you may need to use the above ratios to make a larger quantity of the solution. Peel and chop the garlic, and then place it in a heatproof container, a jar or pan etc. Add boiling water to the garlic until the pieces are just covered. Allow the mixture to steep overnight so the oils to infuse the water. Simply spray all over your yard/garden, paying particular attention to areas that animal frequent. The smell will be strong initially, but will fade quite quickly. Spray the solution once a week or every few days if desired for the ultimate flea-free yard. When spraying your garden, it is important that you do not oversaturate the plants. An oversaturation can affect other beneficial insects in the yard as well. It is best to only apply a small amount of the garlic spray solution to the vegetation within the yard. The high concentration of the solution is enough to keep the fleas from breeding with just a small amount of the mixture. An oversaturation will not offer you any extra flea prevention, but can affect the other insects in a negative way. It takes a lot of garlic in high concentration to present health problems with dogs. They may be curious about the smell and even lick the plants, but unless they graze on a whole load of sprayed plants, which is highly unlikely, there is little to be concerned about. This natural garlic flea prevention spray is for use in outdoors only. It is not recommended for use indoors.